In this video we try to answer the question, Why won’t my yoyo come back? Why won’t my yoyo come back? 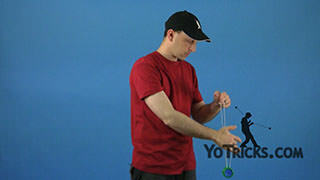 Yoyo TrickOne of the most common questions I get asked online is, Why doesn’t my yoyo wind back up? There are actually a lot of different answers to that question depending on how good you are as a yoyoer, and what kind of yoyo you have, and maybe even how long you’ve had your yoyo. So I am going to try to answer as many variations of this question as possible. So let’s start with the beginner. 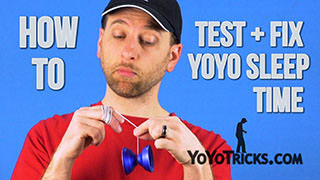 Let’s say that you just got a yoyo, you just got it out of your package. You have never really yoyoed before. You throw it and it doesn’t come back. So you are wondering, How come my yoyo did not come back? Well actually, what was happening, is the yoyo was sleeping down at the bottom of the string. That’s how yoyos are designed. They are actually supposed to spin down at the bottom of the string if you have gotten a good yoyo. The reason it is not coming back is because it is doing something else. It’s sleeping. To get the yoyo to come back up all you need to do is give the yoyo a little tug and it should come back up. 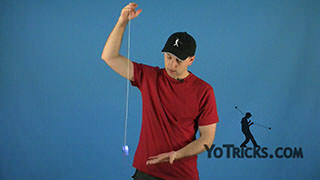 If you are just dropping the yoyo like this, a lot of yoyos will not come right back up. You really need to learn how to do a proper throw. And once you get a proper throw the yoyo should come back up when you pick it up. 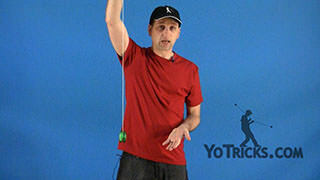 So we have a video teaching you how to do the basic yoyo throw, you can look that up and that should help. Another scenario; lets say you have a ball bearing yoyo like this one, this is the Peter Fish Dominator, and it used to come back up when you pulled it, but now when you try to pull it back up – even though it is spinning very fast – it’s not coming back up anymore. What has happened is that the bearing has gotten dry. It does not have any lube in it anymore. This happens with all ball bearing yoyos. If you want it to play responsive you need to lubricate the bearing every now and then. So, on YoTricks we sell Super Lube and we also sell lubes by other companies. Just put a little bit on the bearing or on the plastic where the bearing sits; that should help the yoyo become responsive again. You may also want to try just changing the string. That can also help out in that scenario. A lot of people want to lubricate their bearings with things they might find in their garage, like WD-40 or other bearing cleaners or lubricants. You do not want to use those on yoyo bearings. Especially if it is a plastic yoyo, it could actually damage the plastic. So, you want to stay away from those. That is actually why yoyo companies came out with their own lubes. So, just throw a little bit of synthetic lubricant onto the yoyo bearing or onto the axle and that should bring it back to life. A third scenario, is if you have an auto-return yoyo. This is the Yomega Brain. Auto-return yoyos even without you pulling on them after they are done sleeping, they are slowing down, they come up all by themselves. If you have had one of these for a while and all of a sudden it stops coming back up automatically then you may ask the question, Why isn’t my yoyo coming back up? In this case, that usually happens after you have changed the string, or if the string has fallen off the yoyo, or something like that. These types of yoyos are different from other yoyos in that most yoyos when you put the string on you only need to put the string on one time. 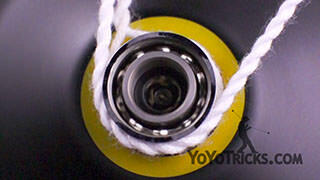 For a Brain yoyo, you actually need to put the string on and wrap it around the axle an additional time. If you have not done that then there is no way for the brain mechanism to work, and it won’t come back automatically. Another thing that might be the problem is if the yoyo has come apart there is this little piece on the inside, and this piece has an o-ring. The o-ring needs to go into the half of the yoyo that has the mechanism that helps it come back. If you put the piece in backwards, again, the yoyo won’t come back up automatically. So that is just another scenario, if you have an auto-return yoyo that is not winding back up. The last one is actually becoming much more common. Some people have bought a brand new yoyo, they already know how to yoyo, they have heard a lot of great things about a particular yoyo online. They get it, they throw it, and it just doesn’t come back. They know what they are doing, they know that it is spinning fast enough. Well what has probably happened is you have bought a higher quality yoyo. In actual fact, a lot of new yoyos are designed to play unresponsive. What that means is that they are designed to not come back up when you pull them up. What you need to do in this case – there is nothing wrong with the yoyo – you actually need to learn how to do what is called a bind. A bind is how you get and unresponsive yoyo like this – this is the YoyoFactory Whip, it is designed to play unresponsive like that – so you need to learn how to bind, because binding is how you get an unresponsive yoyo to wind up. We have made a couple of videos helping you learn how to bind, so look at those. That should help you get over that hurdle. Hopefully this video has answered your questions, to get over this hurdle of why your yoyo won’t wind back up. It may have created more questions than answers, but we will try to get around to those. Hopefully this has helped you out. Why won’t my yoyo come back? Bind Theory – What Makes Yoyo Binds Work?